I got my New York errands done early on Wednesday, slipped into a phone booth to change into my suit, and got to the ballrooms at the Grand Hyatt a few minutes before anything had started at Wednesday night's Edgar Awards. At the end of the long anteroom outside the banquet hall, a bald man slouched on a bench, looking not nearly as tall as he does when gesticulating behind a podium. 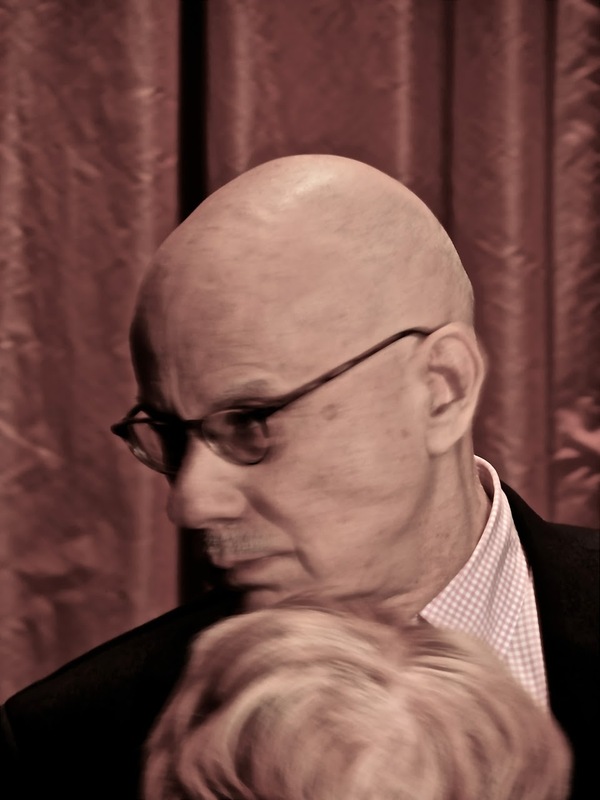 "Mr. Ellroy," I said. "Congratulations." "I've met you before," he said, extending his hand. "You have. Otto's store, when you read from Perfidia." "Did you enjoy it?" he said, straightening slightly. "I did. I read it in a week, a solid hundred pages a night." "That's the way to do it," Ellroy said with an approving nod. "Steady reading, a couch, a dog." "Except for the couch and the dog, just how I did it." "Well, they want me in there. We'll talk later." "I'll be running up, getting in people's way, shooting pictures." "Shoot away." Another approving nod. 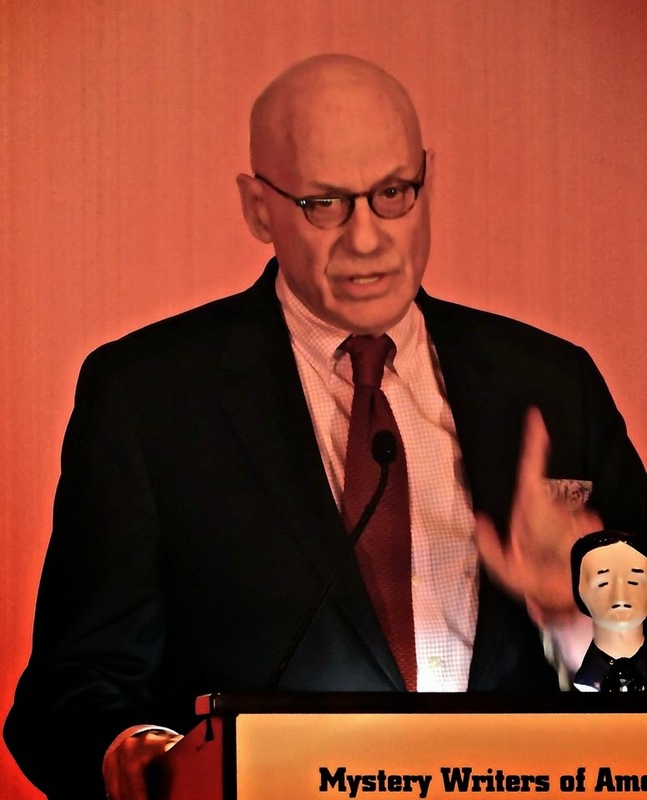 Ellroy talked about dogs again when he accepted the Mystery Writers of America Grand Master award. "My life," he told the crowd, "has been one long journey to commune with the talking dog." This was — in part, at least — a tribute to his publisher, Alfred A. Knopf, whose logo is a borzoi, or Russian wolfhound. Ellroy also said that he sees God in everything, offered the frank literary quotation that "a literature that cannot be vulgarized is no literature at all," and said: "My first words were, `Where's the book?'" and then, with a laugh I took as gently self-mocking, "and `Where's the booze?'" Oh, and Stephen King swore more than Ellroy did. I've met Mr. Ellroy, but I don't think he'd say that he met me before. Perhaps Ellroy is just screwing with people via his palindrome: god / dog. Hmmmm. And I owe to myself to read Ellroy's latest. Well, I will need plenty of time. Robert, if he is messing with people's minds, the wordplay is of longstanding. He has long called himself the Demon Dog, and he has also long called the Lutheran Church a pillar of his life. Well, it was at a big Northern California booksellers convention many years ago, and he must have met hundreds of people that day alone, and I did nothing memorable. But he was quite memorable. Just a very big personality. A big personality is right. I would say, too, that unlike with some other authors, his personality and his past are legitimate subjects of discussion because he has made them so much a part of his work and his public persona.